The 12-bar is an extremely common structure when playing blues. A 12-bar blues is performed, as the name implies, by playing twelve bars in a given arrangement which are repeated through a song. There are plenty of arrangements, based on chord progressions, to use. Here you get a look at some of the most standard. 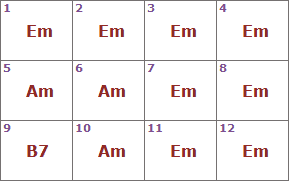 A 12-bar blues are commonly written out by the chords that are used. You can also play scales over these chords. 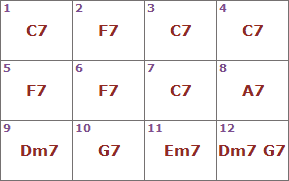 In the key of C, the chords would instead be C7, F7 and G7. You can either play one scale over all bars or change scale as the chord change. In addition, it is a common method to put extra empathize on the tones of the involved chords when the actual chord is being played. You need to develop your ear for this. For an easy start, use the E Pentatonic Major Blues scale over the 12-bar blues displayed above. Try to play the chords with your left hand and notes from the scale with your right. For improvising over this 12-bar blues, you could use the Em Pentatonic Blues scale. 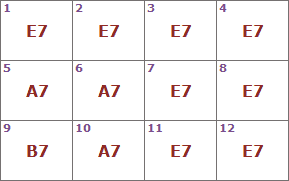 As already said, there are endless ways to vary the twelve bars (it must not necessarily be twelve bars – the 16-bar blues structure is also popular). Also to be familiar with, when learning the 12-bar structure, is the turnaround as in the next example. 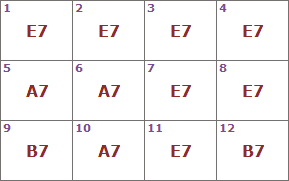 The novelties are only at the end: in the last two bars you should play five measures of the E7 chord and then change to B7 for the last three. The last time the structure is played in a song, it should end on an E chord. Below, you could see more a more detailed presentation, including measures in the bars. In this last example, some extra sophistication and complexity was added to the 12 bar structure and as a result we got a mix of blues and jazz.